Your child's smile is the smile that he or she will have for the rest of his or her life. While crooked teeth may be no big deal for your child now, they could have a negative impact on his or her confidence in the future. If you want your little one to grow up with a smile he or she can be proud of, reach out to your Woodbury and Stillwater area kids' orthodontist today. When treating patients of all ages Dr. Henseler and Dr. Kocian can use braces or clear aligners. However, for braces or clear aligners to be effective, they need to be anchored to something. Typically, that something is another tooth in the arch, but in some cases that may not be best. 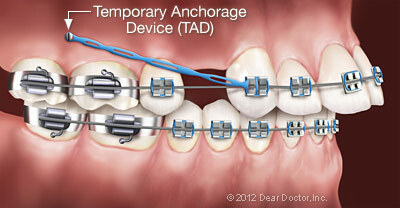 In these instances, we have the option to use temporary anchorage devices. TADs are very similar to dental implants in appearance. They are small, screw-like devices made of titanium alloy that can easily be inserted into the jaw bone to provide an anchor. However, unlike dental implants, which are made to be permanent, TADs are temporary. Once they serve their purpose—they are removed. Without an anchor, orthodontic appliances will sit on the teeth, providing no force. The wires or clear aligners need something to push against so that they can move the crooked teeth into the desired position. TADs offer that something when another tooth is not the best option. They can make possible difficult tooth movements that may have required headgear or jaw surgery in the past. Your child's smile has the potential to impact his or her future. Make sure that impact is a positive one. Call Henseler & Kocian Orthodontics at 651-739-1555 or 651-439-8909 to schedule an appointment at our Woodbury and Stillwater locations, or request an appointment using our easy online form.